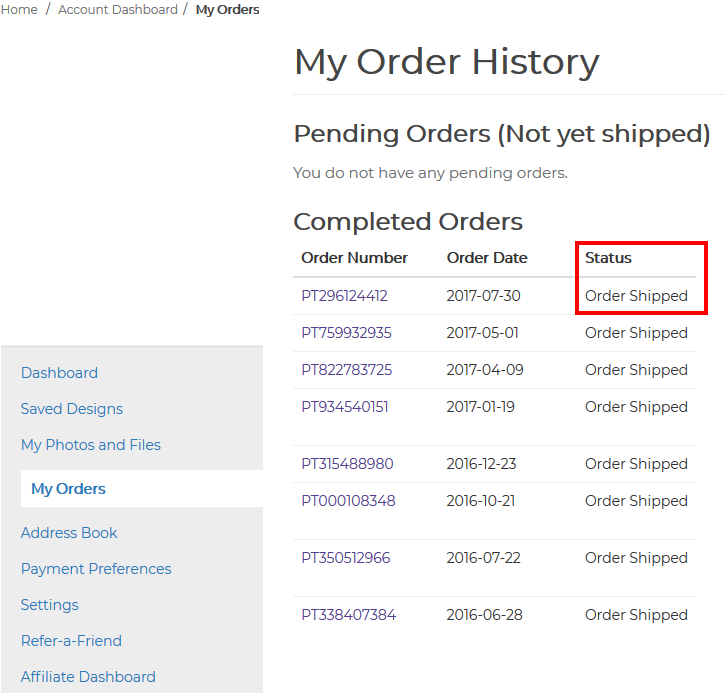 /After Placing my Order /How do I check the status of my order? To check the status of your order, first log in to your account. Then hover over the “Account” icon near the top of your screen and select “My Account” from the drop-down. This will take you to your Dashboard where you can click on the “View Full History” link in the Orders section for information on your past and present orders. Here you will see a list of all orders you made. You can check the status of your order beneath the “Order Status” column. If your order is pending, it hasn’t shipped yet. This could be because you’ve purchased Mailing Service and haven’t added your addresses or it could also be because we are still processing your order or we need to contact you for more information. Once your order has shipped, you will also receive an email with a tracking number for your package which you can use to see where your package is and when it will arrive. You can also click on the View and Track Print Orders link to track your package after it ships.